We have several different models, sizes and colours in stock, ready to be delivered to you for a quick equipment replacement. 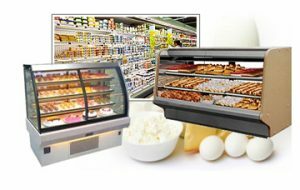 Choose among our large variety of refrigerated counter displays built for all types of businesses such as supermarket meat, fish, cheese and deli departments. Frigo l’Entrepôt also offers you new, refurbished or slighlty used refrigerated counters at low costs. 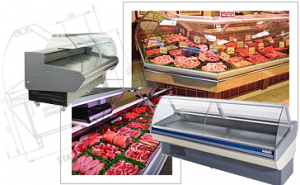 We have the market’s best brand meat and poultry refrigerated counters such as Hill Counters and Arneg. We also have a large variety of closed meat counters with sliding windows for customer service as well as self-service counters . Additionally, we can refurbish your existing refrigerated counters. 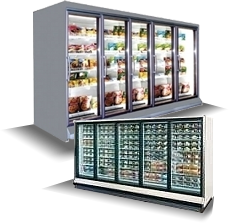 Frigo l’Entrepôt offers standing freezers with doors for any meat department or self-service area. 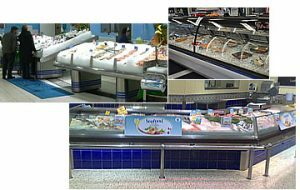 Our fish and seafood counters are specifically built to maximize the water flow from the ice melting during the defrost period. We have the basic “on ice” display counters and the refrigerated counters with gravity coils overhead. Our fish counters are built with the best rust resistant, longer lasting stainless steel metal products. For all your frozen seafood products we offer standing seafood refrigerators with or without doors, as well as standing freezers with glass doors. 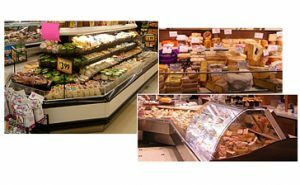 We have Island counters, “Shop around” style, with 3 or 4 decks, exclusively built for supermarket cheese and deli products. Also in stock: serve-over counters, open or closed for cheese departments or stores. Any of these counters can be customized upon your request regarding the sizes, the shapes or the colors. 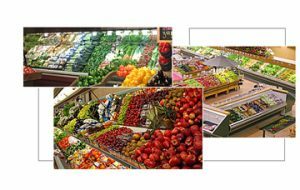 In order to match the design of your store, we have a large variety of supermarket counters such as fruit and vegetable refrigerated display counters, in many sizes, new or refurbished. Some models include an integrated irrigation system especially for fruit and vegetable. We can configure any display arrangement with many display counters by placing them side by side. These types of counters are especially built for dairy products such as milk, butter, yogourt, juice or any other refrigerated product. Available in several sizes and also custom built, we offer them brand new, refurbished or slightly used. Our line also offers pastry refrigerated counters for cakes and desserts or great for cold pizza! Offered with built in compressor as a stand alone unit. Several standing freezers with glass doors are always available in inventory. They can be used to hold any unit or boxed frozen products. The colours of the freezer panels can be painted to match your existing counters to integrate your store’s design perfectly.